At $500 you will enjoy the benefits of SPECIAL GIFT CATEGORY for the rest of either yours or that of the life of OVERSEAS BRATS (founded in 1986). This CD contains the "OSB Gathering Song" along with 15 other tunes written by Brat: Dr. Rick Connell, Heidelberg '75. 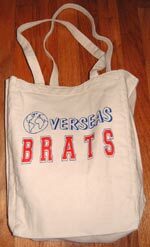 50% of proceeds go to the Ta Touck Village School in Siem Reap, Cambodia (a school started by a Brat, now has a Brat board, and was the OSB "Brat Cause" for 2012). The other 50% covers packing and shipping. Your purchase supports 60-100 young children attending school and learning English. THANK YOU for purchasing! 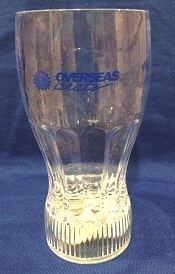 At the end of the day, what's better than having a festive "blinky glass" to enjoy your favorite beverage from! 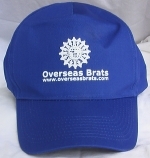 Blinks in multiple colors with a digital light display, with the Overseas Brats Logo. How fun! Order for only $8 which includes packing and shipping. Get your very own OSB Brat Mug, suitable for travel, perfect for coffee or brew. 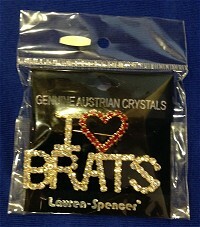 Order for only $16 which includes packing and shipping. For your next travels, why not show your OSB colors with an official OSB luggage tag? Order for only $3 which includes packing and shipping. 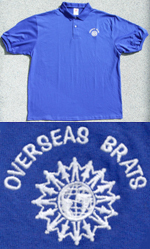 Bright royal blue short-sleeved golf shirt with the OVERSEAS BRATS logo embroidered in white, 50% pre-shrunk cotton and 50% polyester. Available in medium, large and extra large sizes. Cost includes shipping and handling. Available in Medium, Large, Extra Large.